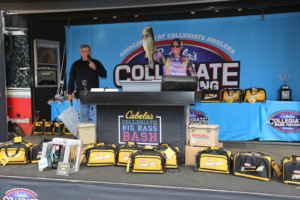 The 2018 Cabela’s Collegiate Big Bass Bash – presented by Berkley was a true test from start to finish for 479 of the best collegiate anglers in the country. 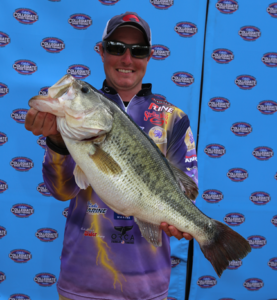 Held on Kentucky Lake in Paris, TN, there were three main variables in play over the two days of competition. First, this was a big bass format event which involves strategy and a great deal of thinking. Second, the water level was dropping at a constant rate. Third, the weather conditions changed on each day of the event. Brian Pahl of Bethel University managed to overcome these challenges to catch a 9.22 pound largemouth bass. This fish, caught on the first day of the event, claimed top prize in session 4 – presented by Garmin and was the overall big bass for the event. “I caught it 20 minutes right before the session ended. We were right here close to Paris Landing,” said Pahl. The Bethel University angler was fishing with two of his fellow teammates in the same boat. The trio decided to take their time getting back to the weigh-in site, and Brian brought this fish across the scales at the beginning of session 4. The fishing out on Kentucky Lake this week proved to be phenomenal. Words cannot put into perspective how healthy this fishery is. During the 8 weigh-in sessions held over two days, the top 10 finishers in each session earned prizes, meaning 80 positions were paid out in total. The smallest fish to earn a prize, the 80th place fish overall, weighed 4.96 lbs. In years past, it was not uncommon to see a 5 pound class fish win top prize in one of the many sessions. Patterns used to target fish this week out on Kentucky Lake varied greatly. Anglers reported using crankbaits, Alabama Rigs, and even spinnerbaits. 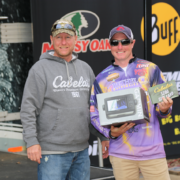 The overall winner of the tournament, Brian Pahl, caught the winning fish flipping shallow bushes with a jig. Pahl was paired with two of his fellow teammates, as they were fishing three to a boat. The angler up front running the trolling motor was casting a crankbait to shallow cover. Pahl was fishing directly behind him pitching to this same cover with a slower more methodical presentation. This approach proved to be key in helping the Bethel University angler land the grand prize winning fish. From the time official practice began on Wednesday, until the scales closed on Sunday afternoon, Kentucky Lake fell nearly four feet in total. Many anglers said that areas where they caught fish in practice were completely out of the water come the final day of the tournament. With water temperatures not quite reaching 60 degrees, these fish were ready to move shallow. “I don’t think they’re ready to spawn yet. The water is still in the upper 50’s. They should be getting ready here soon,” said Pahl. The staging and patterns of the fish can be reflected in the 9.22 pound bass that Bryan Pahl of Bethel University caught. This fish came out of shallow water in flooded bushes. As fish prepare for the spawn, they look for heavy cover to get around and begin to make their beds and lay eggs. Pahl’s winning fish earned him a wide list of prizes. 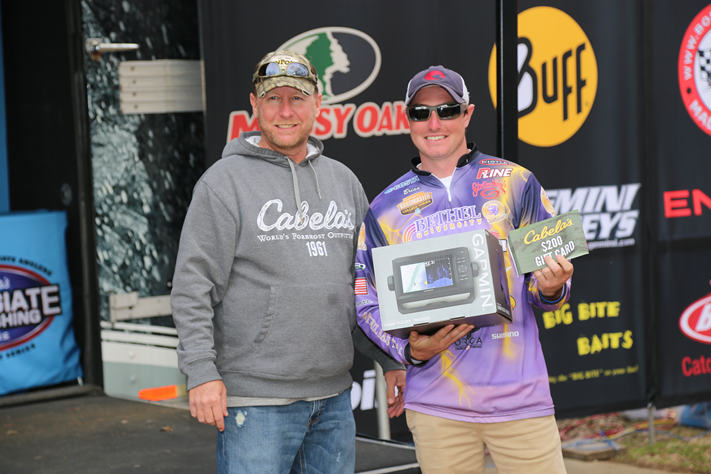 For winning session 4 – presented by Garmin, he received a Garmin 63CV plus a $200 Cabela’s gift card. This is a prize package valued at over $700. The prizes do not stop here though. By winning the overall grand prize, Pahl earned another roughly $5,000 in items. Theses items consisted of : $2,000 Power-Pole gift certificate, $1,000 Cabela’s gift card, 1 KVD Hydrowave, Mustang PFD, Gill rain jacket, $100 Ranger Wear gift card, one Engel cooler, and a Navionics mapping card. Not only did Brian get all of the prizes listed above, he is also aware of the fact that he earned his team valuable school of the year points, “This was huge for school of the year points…We were looking for two top 10 fish in this tournament.” Entering this event, Bethel University sat squarely atop the race for the Cabela’s School of the Year – presented by Abu Garcia. The top two fish weighed in by competitors this week would count towards their team’s school of the year totals. Being a double points event, the stakes were high. Bethel University rose to the challenge, and worked to maintain their lead. The team placed two anglers in the overall top five. Along with Brian Pahl’s 9.22 pound fish, Ricky Harris weighed in a 7.42 pound bass. This fish was good enough for 5th place in the final standings. For a full look at the school of the year standings, click here. It has been mentioned again and again over the past several days, but Kentucky Lake is in rare form right now. Quality fish after quality fish crossed the scales over the two day span of competition. Through the history of this event, this marks the first time it has taken a fish over the nine pound mark to claim the victory. This will set the expectations high looking towards next year’s event.